Bathroom Vanity Refinishing - Is it more affordable to refinish or replace bathroom vanities? 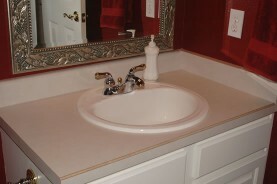 Bathroom vanity refinishing will save you up to 50% or more over messy removal and replacement. The more unique and complex your bathroom vanity is, the more expensive replacement will be compared to refinishing. Be sure to factor in all the replacement costs including plumbing, changing out any mirrors and wall coverings as well as the mess, hassle, and delays of construction. Make your bathroom vanity look new without the need to replace it! 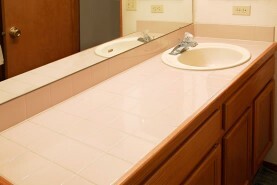 We can change the look of your tile vanity! Bathroom Vanity Refinishing - What types of bathroom vanities can be refinished? 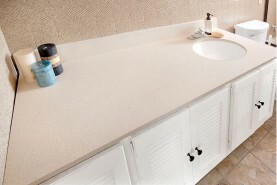 Bathroom vanity refinishing is often the best option for tile, cultured marble, or Formica® countertops. 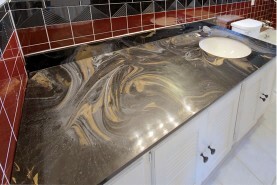 In addition to the bathroom vanities, Miracle Method can also refinish your bathroom sink. Refinishing will extend the useful life of most any bathroom fixture or surface for 15 years or more. The refinishing process includes repairing any damage so your vanity and sink will look and feel like new. No need to replace your cultured marble vanity. Let us refinish it! Bathroom Vanity Refinishing - What color options are available for refinishing bathroom vanities? Miracle Method offers dozens of colors and textures for bathroom vanity refinishing. Solid colors of white, bone, or almond are traditional and practical. Miracle Method also offers our revolutionary new Natural Accents™. 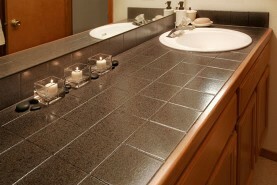 These stone-like finishes are available in many designer colors and allow for some dramatic bathroom makeovers. Bathroom Vanity Refinishing - How do I find a professional refinisher? 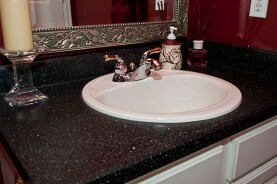 Bathroom vanity refinishing is almost always more affordable, quicker, and easier than replacement. Click on Find a Location or call our toll free locator number, 1-888-271-7690, to find the Miracle Method office closest to you and request a free estimate.